Go to http://migrationology.com/2012/09/loco-moco-hawaii/ for lots more travel and street food! 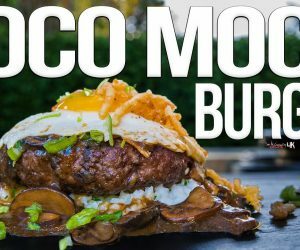 A loco moco is a locally developed Hawaii food that begins with a heaping pile of steamed rice covered in gigantic hamburger steak patties, over easy fried eggs and the entire thing covered in brown beefy gravy. The dish is such a comfort that you may forget what you’re even eating and just be wrapped up in food love. I enjoy my Hawaiian loco moco best when it’s topped with hot sauce and mixed around so it’s juicy and delicious! This particular takeaway container of loco moco was eaten at a small but amazing restaurant in Hau’ula, Hawaii, called Papa Ole’s Kitchen.